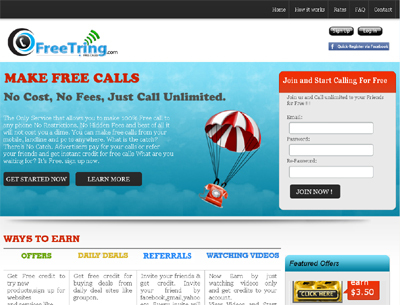 With Freetring.com, international calls can now be made from all over the world for free, with the costs being paid for by its advertisers. Using VoIP communications, Freetring.com allows customers to connect free calls from any mobile phone, pc, or landline telephone. Customers can also earn more credits for calls by referring the service to their friends, buying online deals, watching videos, and participating in product and website trials.